Here’s a Halloween treat for you. I was driving on a rural Oklahoma road today and turned around on a dead end where there were three or four trailers that looked a little shady. I don’t want to be judgmental here, but they could be people who are just down on their luck, meth dealers, independent souls, or whatever you can imagine. While turning around, the last trailer had a large dog chained in the yard, jumping towards us, although not barking. Just watching us. As we went by the trailer, something caught my eye and I jerked my camera up to catch it, not even knowing if it was real or not. Here’s what I saw. 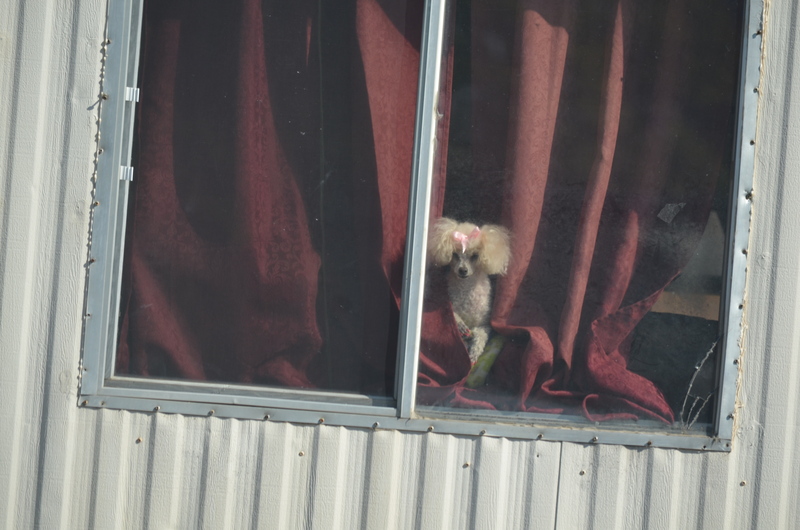 I hope you can see the pink bow and the red nail polish on the fanciest living thing in the neighborhood.